The tool is 100% automated so you can make any number of teams you want. For example, an educator may want to create senior capstone teams for engineering programs, or high-performing teams for leadership classes. The Teaming Tool allows instructors to customize teams based on educational needs. Teachers use the cloud-based Indigo dashboard to access the automated tool to organize students for a variety of purposes. Students can be paired with like-minded advisers. Colleges can use the tool to pair roommates with similar interests. Instructors click on the Teaming Tool icon (located in the toolbar at the top of the dashboard) to bring up the teaming app. 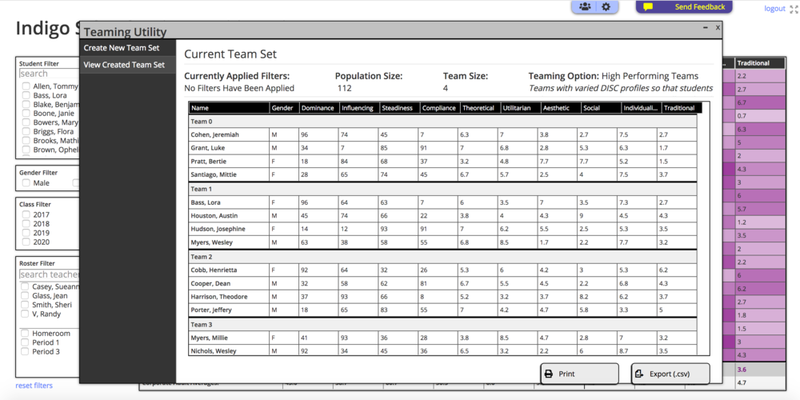 Simply input the team size and the team type, based on one of four teaming algorithms. 1.) Harmonious Teams: Teams of students with similar profiles based on their Indigo Assessment profiles that look at Theoretical, Aesthetic, and Social motivators. Aligning traits and key motivators in this way help to foster intra-group harmony and cooperation. 2.) High Performance Teams: Form teams with varied profiles so that students within each group are temperamentally inclined toward different tasks (e.g., a high Dominance student might be more inclined toward giving oral presentations, while a high Compliance student might be more inclined toward detail-oriented research). 3.) Teams with similar profiles: Form teams of students with similar behavioral traits. 4.) Teams with similar motivators: Form teams of students with similar motivators. Clicking the 'Submit' button applies the chosen teaming algorithm to the selected set of students. Teachers can manually make changes on their own.